Accompanied by the typical British weather and a very enthusiastic team, a big event took place at Roadford Lake Side in the south of the United Kingdom. 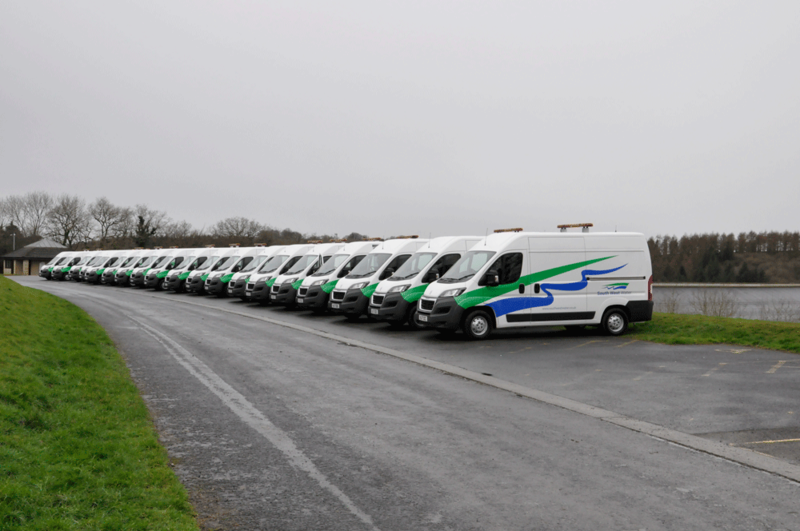 Kensway Engineering & Rioned UK Ltd handed over 15 brand new vans with Rioned AquaJets van packs to South West Water. South West Water is serving over 800,000 customers in Devon and Cornwall. The total length of wastewater network is 15,500 km. 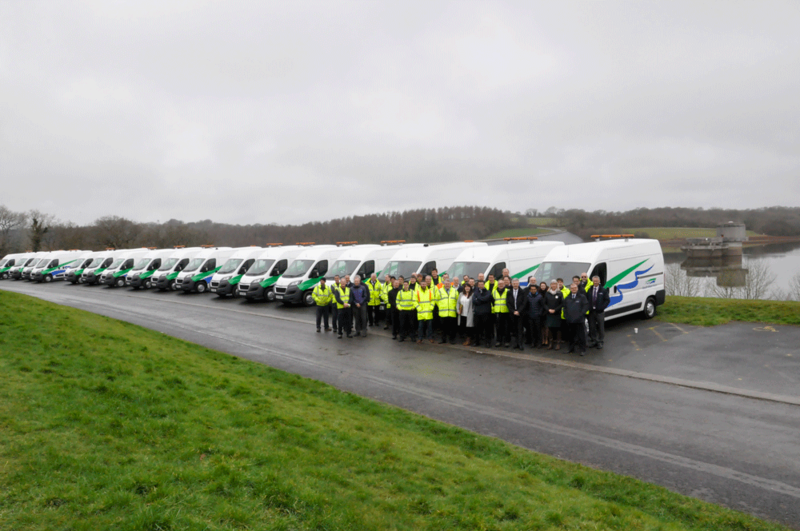 On the 1st of March, South West Water operatives got together for handover and training of these new Rioned AquaJets. Ken Burton (Proprietor) at Kensway Engineering who are the appointed dealer for the Rioned product in the south west of the UK and Mark Cox (Sales Manager) Rioned UK were involved in this project. The initial request was to discuss the possibility of designing a drainage van that could carry all the kit the guys needed but still be under the 3500 kgs vehicle capacity. Ken and Mark carried out a live demo for the project team with the Rioned AquaJet. 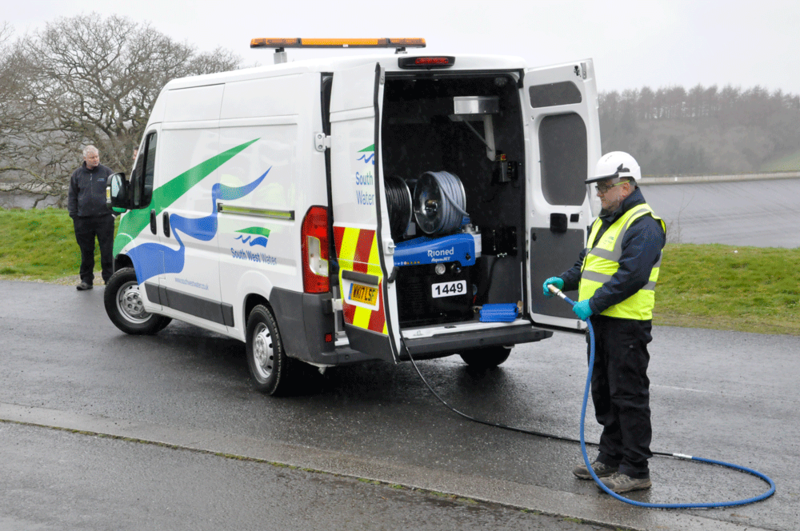 With using a smaller than normal jetter in a smaller than normal van to show that it is all about design and minimal pressure loss, rather than ‘’the bigger, the better’’. The demo was a success and the team was very impressed that such a small machine could perform like it did. Kensway Engineering. customized all the vans with aluminum storage spaces and waterproof spray lining, since low weight and best quality have always been the two key factors in this project. And after order and delivery of the AquaJets, Mark Cox from Rioned UK gave an extensive product training to the South West Water team on the 1st of March. South West Water also decided to take advantage of the 5 years repair and maintenance contract offered to them by Kensway Engineering, giving them piece of mind and a fixed budget. Radenko Danilovic, Project Manager for South West Water informed us that they chose the Rioned AquaJet because of its compact size and it still got a lot of power. Because of the total weight being less than 3500 kgs, the operatives can drive these vans with a standard driving licence. Main reason for the South West Water Management to initiate this was to improve service and efficiency. With the introduction of these new Rioned AquaJets with Riomote remote control, eControl, 100 metres high pressure hose and full nozzle kits, it allows the South West Water team to work with single man operation from now on. The team is very excited to start working with their new equipment!